When press-fitting the bearing into the knuckle, be sure to apply pressure only to the outer ring. When pressing the hub into the inner ring, force must only be applied to the inner ring and the hub. The application of force to the wrong part of the bearing will render it useless by severely damaging the balls and raceways. After each step, check for binding or damage by rotating the bearing to be sure it turns smoothly. Press-fitting locks the bearing radially but to lock it axially, be sure to install the snap ring where required. Note: For applications that utilize ABS: Caution should be taken to make sure that the seal with the ABS magnetic encoder is installed in the correct direction. The side with the magnetic encoder needs to be installed in the inboard direction, closest to the ABS sensor. If it is installed backwards, the ABS system will not function. Lightly lubricate and then carefully align the splines of the CV shaft with the splines of the hub to prevent damage. Using the proper tool, pull the axle yolk into the hub and seat against the bearing. Install a new axle nut, using the specific torque nut for that application. With the vehicle on the ground, do the final torqueing to the OEM specifications. 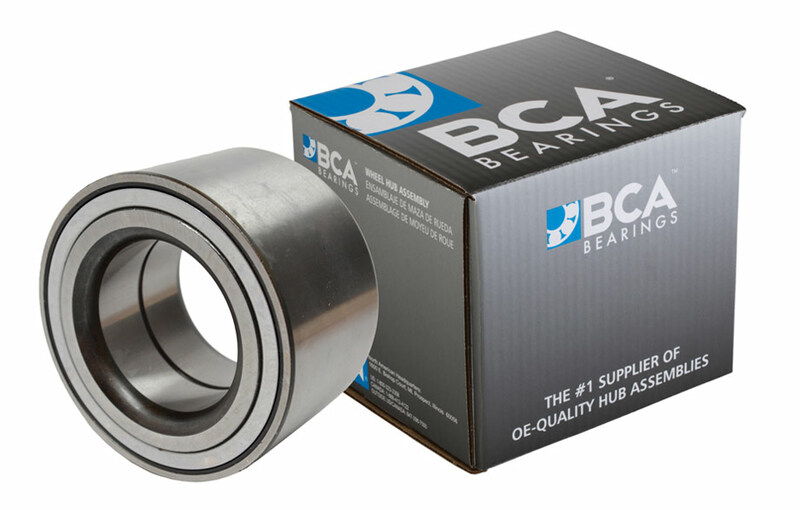 This assures the proper mating of the split inner rings of the bearing needed to achieve the proper internal clearance.